We propose a procedure to estimate the model parameters of presented nonlinear Resistance-Capacitance (RC) and the widely used linear Resistance-Inductance-Capacitance (RIC) models of the respiratory system by Maximum Likelihood Estimator (MLE). The measurement noise is assumed to be Generalized Gaussian Distributed (GGD), and the variance and the shape factor of the measurement noise are estimated by MLE and Kurtosis method, respectively. The performance of the MLE algorithm is also demonstrated by the Cramer-Rao Lower Bound (CRLB) with artificially produced respiratory signals. Airway flow, mask pressure, and lung volume are measured from patients with Chronic Obstructive Pulmonary Disease (COPD) under the noninvasive ventilation and from healthy subjects. Simulations show that respiratory signals from healthy subjects are better represented by the RIC model compared to the nonlinear RC model. On the other hand, the Patient group respiratory signals are fitted to the nonlinear RC model with lower measurement noise variance, better converged measurement noise shape factor, and model parameter tracks. Also, it is observed that for the Patient group the shape factor of the measurement noise converges to values between 1 and 2 whereas for the Control group shape factor values are estimated in the super-Gaussian area. The assessment of the respiratory function is an important part of the clinical medicine . Although the clinicians use some standard evaluation techniques and there are bewildering variety of computerized test equipments, the automatic measurement of the lung mechanics requires further work. The main existing problems presented are the following. (i) The lung is a dynamic system such that its parameters should be monitored continuously even with the ventilatory assistance ; (ii) the signals measured at the output of this dynamic system, the input, and the system parameters might be nonlinearly related to each other over one breathing period [2, 3]; and (iii) the proposed methods for investigating the lung mechanics should not require any kind of patient's cooperation. Using the measured respiratory signals (i.e., airway flow, , and airway pressure (mask pressure), ), in the literature, conventional least square (LS) and recursive least square methods were used to estimate the linear and nonlinear model parameters of the respiratory system [4–7]. Regarding the measured time series of airway flow and mask pressure, the abovementioned studies have two major assumptions: (i) the airway flow and the mask pressure are deterministic signals, and (ii) the uncertainty (referred to as a measurement noise) between the measurements and the model is zero-mean Gaussian distributed white noise. However, to the best of our knowledge, there is no study which attempts to define the noise in the respiratory system model fitting to the measured respiratory signals. Thus it is of interest to choose generalized noise model to express the measurement noise involved in the respiratory system identification problem. In this study, we present the well-known Maximum Likelihood Estimation (MLE) for the respiratory parameter estimation, by assuming that the measurement noise is General Gaussian Distributed (GGD). MLE together with GGD constitute a statistically powerful method which allows more degrees of freedom to explore the statistical parameters of the measurement noise. In the simulations, recently presented nonlinear Resistance-Capacitance (RC) and widely used linear Resistance-Inductance-Capacitance (RIC) models [5, 8] were used to represent the respiratory system. Accordingly, one of our aims was to derive the theoretical expressions of the presented lung models in the framework of the MLE algorithm with the GGD noise model. In this respect, the artificially produced airway flow and the mask pressure signals that mimic the patients with Chronic Obstructive Pulmonary Disease (COPD) under non-invasive mechanical ventilation were used for the estimator assessment. Then, the parameters of both respiratory models were estimated from the observed signals collected from the COPD patients under non-invasive mechanical ventilation (Patient group) and the healthy subjects (Control group). The rest of the paper is organized as follows. Section 2 reviews the nonlinear RC and RIC models of the respiratory system during non-invasive ventilation. The measurement equations of the models are also drawn in Section 2. In Section 3, MLE and GGD are summarized and the estimation of the RIC and nonlinear RC models' parameters is explained. Also estimator performance assessment criteria (i.e., the Cramer-RAO Lower Bound (CRLB)) were depicted in the same section. In Section 4, the experimental procedure was explained. The results of the simulations are presented and discussed in Section 5. Finally, in Section 6 conclusions are drawn. where represents the effect of the maximal patient's effort on , and are the inspiration duration and the total duration of one respiration cycle, respectively. In this paper is added to the unknown parameter vector whereas and are set to constant values derived from the experimental signals. The time constant is an important parameter for mostly determining the expiratory asynchrony in the noninvasive ventilation . A constant value was chosen for in order to resemble the respiratory system. where and PEEP represent the maximal ventilation pressure and Positive End Expiration Pressure, respectively. The ventilator inspiration time constant corresponds to the flow acceleration speed of the ventilator, whereas the ventilator expiration time constant is the ventilator deceleration speed and contributes to the pressure rise at the termination of the inspiration. The set values for the parameters in and are in Table 1. and were applied in the simulations of the artificial signals and COPD patients' signals, whereas, for the control group, was not included to respiratory models. Parameters of the respiratory signals in the simulations. ER and EMP stand for experimental reading and estimated model parameter, respectively. where , , , , , and , , constitute the unknown parameter vectors for the nonlinear RC and RIC models, respectively. is the measured mask pressure and is the measured airway flow. represents the gas volume changes above the Residual Volume (RV) in the lungs and is the gradient of the airway flow. (a) Nonlinear one-compartment respiration model with noninvasive ventilator effect. (b) Linear one-compartment RIC model of the lung with noninvasive ventilator effect. where is the GGD measurement noise; and are the discrete versions of and ; discrete time steps are , and and are the parameter vectors to be estimated. Deriving (4) and (5) constitutes the first step for the respiratory parameter estimation by MLE. We now need to define the measurement noise and propose the probability distribution for the best convergence of the parameters. where is the many-to-one function that yields the left side of (4) or (5). can be defined as , where is the Gamma function and is a scaling factor which allows that . The variance and the shape factor of GGD are represented as and , respectively. These two parameters should be estimated in order to define the measurement noise. It is reminded that since the respiratory system, consequently respiratory signals, differs between diseased and healthy cases, we expect the parameters of GGD-based measurement noise to provide the valuable information about the respiratory models fit to the measured signals. It should also be noted that, in the above derivation, the system model parameters, , and the measurement noise shape factor, , are considered as known quantities. where and denote the fourth- and second- order central moments of the measurement noise, respectively. However, (14) cannot be solved in the explicit form. Thus, a lookup table was generated for the inversion of the Kurtosis equation. Equations (15), (17), and (7) form the basis of the MLE algorithm. It should also be noted that in the above derivation the measurement noise shape factor, , and variance, , are considered as known quantities. The MLE algorithm, shown in Algorithm 1, was coded in Matlab and applied first to the artificially generated respiratory signals (mask pressure, airway flow, and lung volume), then to respiratory signals acquired from the COPD patients with the noninvasive ventilator assistance, and finally to the healthy subjects. Before depicting the results from the real respiratory signals, the performance of the estimator which is bounded by the respiratory models and the properties of the respiratory signals should be demonstrated. In statistical signal processing there are two ways to measure the estimator's ability: (i) computing the Lower Bounds (LBs) on the estimator's variance and (ii) calculating the Mean Square Error (MSE) on the estimated parameters. 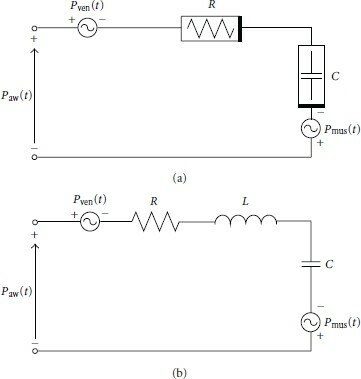 Both LB and MSE are calculated with the true value of the parameters, thus with the artificial signals. In the case of real signals, we estimated the parameters from five different breath cycles of the same subject and plotted on the same figure. Apart from the effects of the small differences between breath cycles, the estimator is expected to result in the same parameter estimations. This procedure acts as a self-performance measurement in the real signal processing. The airway flow inside the upper airways was simulated as a sinusoidal signal with the parameters shown in Table 1. The lung volume (i.e., Tidal Volume) was calculated by the integration of the airway flow over one breathing cycle. Pressure inside the facemask was calculated by (14) for the nonlinear RC model and by (12) for the RIC model with the help of the model parameters shown in Table 1. Zero-mean white Gaussian noise with different SNR levels was then added to the airway pressure and airway flow. Since Maximum Likelihood incorporates the "maximization" step and uses hill-climbing approach, reaching only to local minima can be guaranteed. However, there are two ways to avoid local minima: to change the initial values for different starting points and to find the optimum initial values by considering a nonlinear respiratory model and the constraints on the parameters. In our studies we employed the two approaches. Monte Carlo averaging ( ) is used to decrease the effects of the initial value selection whereas initial values are generated from the constrained sets of the parameters. For the real data case, same initial values were used for five different breath cycle simulations. The mean and variance of the initial values were chosen solely to achieve the convergence of the parameters. On the other hand, the initial values of and were set to constant values. Table 2 summarizes the initial values selected for the simulations. Initial values selected for the simulations. stands for the Gaussian distribution. Pham and DeFigueiredo  showed that ML estimate of the mean of GGD noise is unbiased for . Moreover, the asymptotic behavior of ML estimates for the uniform and Laplacian noises has been investigated in  yielding that, even if the priori distribution of a noise is unknown, the stochastic CRB can be attained asymptotically by the ML estimator derived for a Gaussian signal. Hence, for the GGD-type measurement noise having shape factors other than , we use asymptotic property of MLE and accept (19) for the bound calculation. Figure 2 shows the CRLB for the parameter estimates together with the estimator variances in one breath cycle. First of all, although we have convergence of the parameters at , we set for the demonstration of the lower bound clearly. CRLB and parameter error variances are calculated by (19) and (9), respectively, by processing the artificial signals. As it is seen from Figure 2, the variance of the estimator follows the CRLB very closely for all parameters. Especially in RIC model MLE is very successful, because estimator variances reach to the CRLB value at for all parameters. However, for the nonlinear RC model it can be seen that , , and have very large CRLB values, whereas and have lower CRLB values than they have in RIC model. Interestingly, we also observe that estimator variances follow the CRLB for the nonlinear RC model parameters. Cramer-Rao Lower Bounds (dotted red line) and estimator variances (black line) versus iteration. We can claim with some confidence that presented CRLB values are the minimum attainable estimator variance bound for the nonlinear RC model. First, CRLB is computed by the real values of the model parameters (no initialization problem), and second, for the GGD-type measurement noise, asymptotic efficiency and lack of bias of the ML estimates can be used (Gaussian noise case). However, we note that, because the Hessian matrix depends on the nonlinear model parameters as well as GGD noise parameters, maximization of the Fisher Information Matrix constitutes high variance bounds. Thus we do not claim that the ML estimators are the best choice among the estimator family. On the other hand, both MSE and CRLB curves clearly suggest that, for the nonlinear RC model, ML estimator gives the optimum variance with regard to the CRLB. and is plotted versus signal-to-noise ratio (SNR). The only reason to use different SNR is to demonstrate the estimator's ability in estimating the parameters' embedded different noise variances. Since the measurement noise consists of the residuals between the real measured signal and the used respiratory model, we expect to estimate various measurement noise variances. Figure 3 shows the MSE versus SNR plots where Gaussian distributed measurement noise is added. Figure 3 is very inline with Figure 2 in a way that , , and parameters show higher MSE values than the rest. This can be easily explained by the nonlinear dependance between these parameters and the airway pressure. In other words, in the nonlinear RC model, the Hessian matrix is calculated as a function of these nonlinear parameters which in turn increases the estimation errors at each iteration. However, although MSE values were higher for nonlinear parameters, the convergence was achieved for all parameters in the nonlinear RC model. It is also interesting to notice that, as it is in CRLB results, and have lower MSE values than they have in RIC model. That is, although the nonlinear RC model has nonlinear parameters that have relatively higher MSE values, it is still optimum in the sense of estimator performance. (a) Mean Squared Error (MSE) versus SNR for linear RIC model parameter estimation produced by artificial signals. (b) Mean Squared Error (MSE) versus SNR for nonlinear model parameter estimation produced by artificial signals. Seven male and one female patients with COPD and four male and two female healthy nonsmoking subjects (without any respiratory disease) were recruited. Patients were breathing with the support of a non-invasive ventilator (Respironics, Inc., BIPAP S/T IPAP: ; PEEP: ) via facemask (Respironics, Inc., spectrum size: medium and small), whereas subjects from Control Group were breathing via facemask without the support of the non-invasive ventilation. In both Groups, the mask pressure, the airway flow, and tidal volume were measured by the pneumotachograph and the pressure transducer system (Hans Rudolph, Inc., Research pneumotachograph system). Acquired signals are digitized by a sampling rate of . During acquisition, subjects were awake and in supine position breathing through the facemask. At least 10 breathing cycles of the airway flow, the mask pressure, and the lung volume signals were recorded by the data acquisition system (National Instrument DAQCard-6036E ADC-16bit) and stored into the computer for signal processing. The airway flow signal was the first software filtered to remove high-frequency noise with 8th-order Butterworth low-pass filter with cutoff frequency of , and then processed to detect the breathing cycle onset and end. Recorded signals were divided by breathing cycles with the consideration of the ventilator trigger time, the inspiration, and the expiration time. Five clear breathing cycles were chosen for the processing step. Accordingly, the parameters , , (i.e., , , and ), PEEP, and were set to the real values measured from the subject's respiratory signals. and were and was set to . MLE algorithm depicted in Algorithm 1 was applied to the measured respiratory signals, and the resulting measurement noise variance, measurement noise shape factor, and parameter convergence tracks were plotted. In order to assess the estimator, results from five different breath cycles were illustrated on the same figure. The variance and the shape factor of the measurement noise were estimated for all subjects by MLE as depicted in Algorithm 1. Figures 4 and 5 show the estimated for the representative subjects in the Patient group and in the Control group, respectively. Estimated is also shown in Figures 6 and 7 for the representative subjects in the Patient group and in the Control group, respectively. First of all, it is apparent that both and were converged to the specific value for both groups and for all breath cycles. Estimated measurement noise variance produced by representative COPD patient (a) for RIC model and (b) for nonlinear RC model. Estimated measurement noise variance produced by representative healthy patient (a) for RIC model and (b) for nonlinear RC model. Estimated measurement noise shape factor produced by representative COPD patient (a) for RIC model and (b) for nonlinear RC model. Estimated measurement noise shape factor produced by representative healthy patient (a) for RIC model (b) for nonlinear RC model. From Figures 4 and 5, we can observe that measurement noise variance is much higher in the Patient group than in the Control group. As it is explained in the above section, the initial is set to times higher in the Patient group due to the convergence of the variance, and in the RIC model it is increased to nearly . Also we can see that increase in is higher in the RIC model; thus, for the nonlinear RC model, estimated measurement noise variance is lower in the Patient group. Hence, first important finding can be drawn that Patient group respiratory signals are fitted to the nonlinear RC model with lower measurement noise variance (i.e., lower the variance of the residuals) than to the linear RIC model. Since the lower the variance the better the distribution spotted (which means that the residuals are concentrated to the mean with minimum variance), it is easily concluded that the nonlinear RC model is better fitted to the respiratory signals acquired from Patient group. On the other hand, for the Control group it is totally reverse. Respiratory signals from each healthy subject resulted in higher in the nonlinear RC model, so that the RIC model is better fitted to the respiratory signals from Control group. We can also support the above argument with the estimates. From Figure 6(b) we see that nearly all breaths were converged to , but Figure 6(a) shows more scattered convergence of the waveforms. Control group signals also converge to the specific value for the RIC model, whereas in the nonlinear RC model they were spread in the super-Gaussian area (see Figure 7). Since it is desirable to have concentrated convergence tracks, RIC and nonlinear RC models better describe the respiratory signals from Control and Patient groups, respectively. Moreover, Figures 6 and 7 show another very important finding: respiratory signals from Patient group resulted in the shape factors in the sub-Gaussian area whereas super-Gaussian distributed measurement noise was achieved by the Control group respiratory signals. This very distinct result directly indicates the distribution of the measurement noise (i.e., the residuals). The Patient group respiratory signals are fitted to the respiratory models with sub-Gaussian distributed residuals (mostly Laplacian-type ), whereas super-Gaussian distributed residuals resulted when Control group respiratory signals are processed. These above findings are the direct consequence of three important effects: (i) the properties of the measured respiratory signals (i.e., airway flow and mask pressure), (ii) the noninvasive ventilator, and (iii) the used respiratory system models. The properties of the measured signals are defined as the length of the processed signals (usually very short in the Patient group), energy content of the signal (airway flow is the energy signal in the Control group, whereas for the Patient group it is defined as a power signal), shape of the signal (Control group signals are uniform and smooth signals without sharp edges), and the uncertainty hidden in the signal. Noninvasive ventilator has major contribution to the properties of the respiratory signal, and more importantly respiratory system response is altered with the presence of ventilator-generated pressure. Finally, respiratory models have influence on the result by execution of different mathematical relations. Hence, these items have effects on the results in different scale by comprising the differences between Patient and Control groups and between the RIC and nonlinear RC models. Convergence waveforms of both RIC and nonlinear RC models' parameters processed for five different breath cycles were given in Figures 8 and 9 for the representative COPD patient's signals and healthy subject's signals, respectively. First of all, it can be observed that, for most of the parameters in different breath cycles, the estimates are converged to the specific value throughout the iterations (notice that for Figure 8(b), because of the convergence purposes). (a) Linear RIC model parameter estimation for five different breath cycles, produced by representative COPD patient's signals. (b) Nonlinear model parameter estimation for five different breath cycles, produced by representative COPD patient's signals. (a) Linear RIC model parameter estimation for five different breath cycles, produced by representative healthy subject's signals. (b) Nonlinear model parameter estimation for five different breath cycles, produced by representative healthy subject's signals. If RIC and nonlinear RC models were compared to each other, we saw that RIC model resulted in very flat estimations (fast convergence). However in the nonlinear model, we have convergence problems at the nonlinear parameters ( and ) for the Control group (see Figure 9(b)). It is true, even though we have very smooth and estimates. This result encourages the findings that nonlinear RC model is not a good representation of the Control group respiratory signals. On the other hand, it can be easily depicted from Figure 8 that breath-to-breath variations are higher in the RIC model than in the nonlinear RC model for the Patient group. Since it is desirable to have minimum breath-to-breath variations, we again conclude that, for Patient group, nonlinear RC model is better fitted to the measured respiratory signals. The closer look at Figures 8 and 9 reveals the estimated parameter values. We can see that, for both groups, parameter in the RIC model and parameter in the nonlinear RC model; as well as parameter in the RIC and nonlinear RC models were converged to the more or less same values. was estimated for the Control group, whereas always was observed in the Patient group. That shows that the healthy person uses inspiratory muscles less than the COPD patients. We also observed that parameters and are always higher values in the Patient group than in the Control group. Finally, parameter was converged to values less than in the Control group, whereas it is well above for the Patient group. The MLE approach and its theoretical performance of the MLE were covered in Section 3.2, and the estimator performance on the parameter convergence was discussed in Section 5.2. However, to be complete, we have to mention that MLE method has potentially serious limitations and constraints in terms of convergence in measured respiratory signal processing. As seen from Figure 8(b) and Figure 9(b), for the nonlinear RC model we have considerable convergence difficulties on nonlinearly related parameters. Moreover, it is observed that MLE required longer computation time for the nonlinear RC model than for the linear RIC model. Performance degradation on MLE can easily be attributed to the nonlinear, non-Gaussian state-space models. The major estimation problem central to gradient-based approaches, such as MLE, is essentially dealing with the initialization. However, as it is covered earlier, confounds between the parameter estimates, including the intraindividual differences, demonstrated the ability of the MLE with the non-Gaussian noise as a diagnostic tool for the COPD patients. Thus, we see these methodological difficulties not so much as a hurdle but more as an even stronger incentive for the biomedical scientists to include intensive repeated researches in nonlinear and non-Gaussian models. In this paper we introduced a time-domain methodology to determine the respiratory mechanics of COPD patients under the non-invasive ventilation based on the inverse system modeling approach. Maximum likelihood estimation implemented by Newton-Raphson algorithm yielded optimum estimators for both the linear RIC and the nonlinear RC models. Moreover, the use of generalized Gaussian distribution provided a crucial factor in explaining the measurement noise distribution in the real signal case. We found that respiratory signals from Control group are better represented by the RIC model compared to the nonlinear RC model. On the other hand, the nonlinear RC model is fitted to respiratory signals from Patient group with lower measurement noise variance, better converged measurement noise shape factor, and model parameter tracks. Also, it is observed that, in the Control group, the shape factor of the measurement noise is much larger than in the COPD patients group. That indicates that the uncertainties between the patients' respiratory signals and the respiratory models have Laplacian distribution, whereas for the Control group it is in the super-Gaussian area. Finally, MLE is proven to be very powerful statistical signal processing technique for the parameter estimation in the non-Gaussian noise. By using the real respiratory signals, the respiratory system is identified for Patient and Control groups. However, although the algorithm is applied to the dataset obtained in our labs, the validation with more datasets and subjects will confirm the applicability of the MLE algorithm. The authors gratefully acknowledge the contribution of Prof. Dr. Ertugrul Eris for the technical support, Prof. Dr. Nurhayat Yildirim for the COPD patients' data acquisition, and reviewers' comment. This paper was partially supported by The Research Fund of The University of Istanbul. Project nos. are 3898, BYP-6687, and T-965/06102006.